I love breakfast smoothies. Also called breakfast shakes, weight loss smoothies, green smoothies, or detox smoothies, there’s no better way to start the day then with a satisfying, yummy serving of blended fruits and vegetables. They have a ton of nutrition as well as protein and lots of fiber. After eating a healthy breakfast smoothie in the morning, I don’t feel heavy or bloated compared to a “traditional” breakfast with eggs, meats, and carbs. 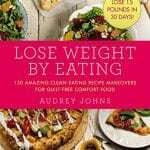 I go into the day with a positive mental boost knowing I’ve started my day right, and as a bonus, my weight loss goals are often easier to achieve. It’s pretty easy to make a healthy smoothie recipe. Add the ingredients one at a time to ensure a smooth blending process. Start with the greens, like spinach or kale, then add the fruits and other ingredients later. Also, do not add extra sugar or use fruit juice, you want to keep these breakfast smoothies as healthy and nutritious as possible. 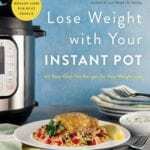 For best results, don’t add the ingredients all at once or you may have a hard time blending them properly. 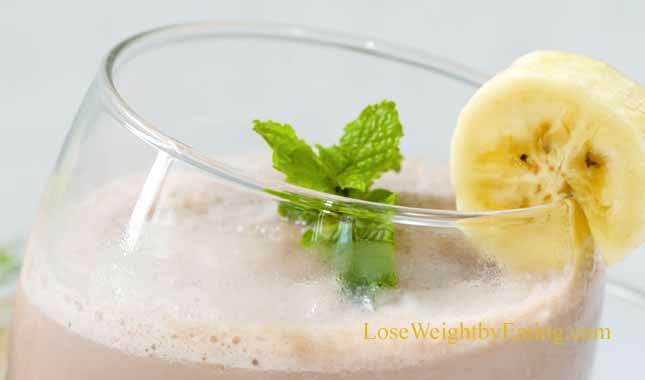 Special Tip: Breakfast smoothies are a powerful weight loss tool that you can and should use every day. To make the best breakfast smoothies as conveniently as possible, check out our Recommended Smoothie Blenders or see our list of the Top 10 Best Selling Smoothie Blenders. 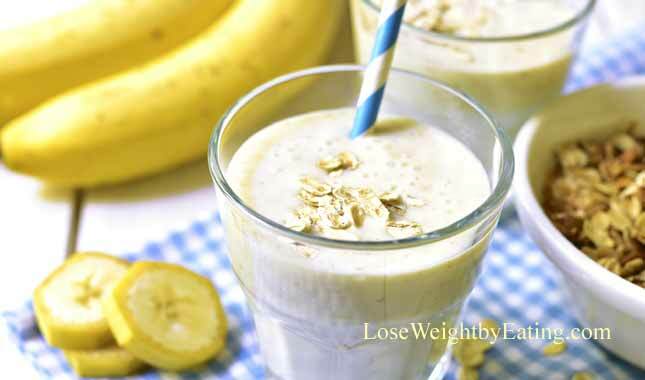 Here are my Top 10 Healthy Breakfast Smoothies that not only taste delicious, but also my favorite choice for best breakfast for weight loss. Allow the seeds to soak in your fridge for 8 hours (I do this overnight) shake the jar a couple times before you go to bed and a couple times in the morning before you make the shake. This will allow the seeds to better expand. 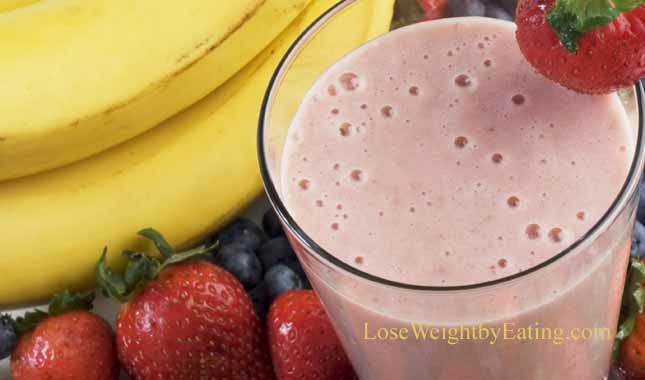 Strawberries, blueberries, raspberries, banana, and apple are all very rich in Vitamin C and antioxidants, making this Berry Banana Breakfast Smoothie a nutritional powerhouse. 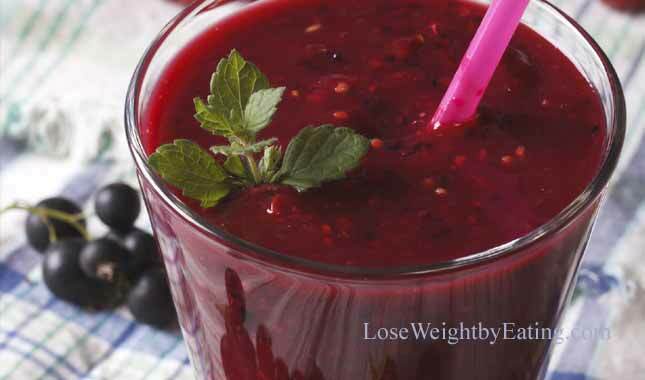 As a bonus, this smoothie is metabolism boosting, further aiding in weight loss and weight maintenance. This yummy Jamba Juice® copycat is delicious and easy to make on the busiest mornings, if you prefer a “greener” shake leave the top leaves on your strawberries and add a ½ cup of spinach, you won’t be able to taste them, but you will benefit from the added healthy boost. Cut and freeze the banana for 4 or more hours (do this the night before) and freeze all of the berries if not already frozen, this will make a thicker, colder shake. Do you remember the Orange Creamsicle® Bar you used to have as a kid? 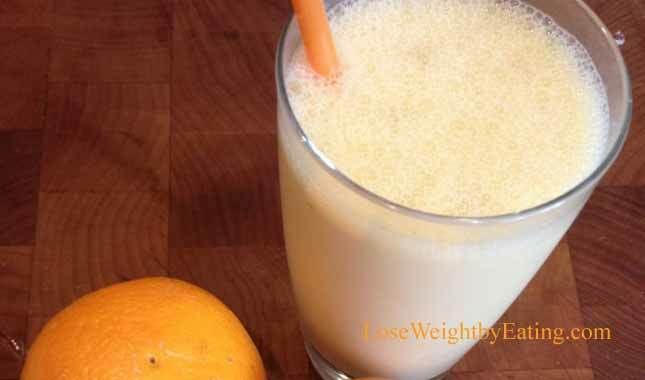 This Skinny Orange Dream Smoothie tastes very similar, but is actually good for you, too. 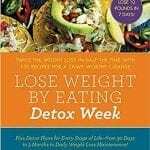 It’s packed with lots of Vitamin C as well as other metabolism boosting ingredients. This make ahead breakfast ensures a fast and efficent morning, and keeps you full for hours. Soak the chia seeds in the milk overnight in the fridge. Blend with the pineapple, yogurt, coconut and coconut oil. This Chocolate, Banana and Almond Butter Smoothie is packed full of natural protein, and tastes wonderful. Add in strawberries, peaches or pineapple as you like for an added boost of flavor. Growing up, Strawberry Banana smoothies were a breakfast staple in my house, I would blend strawberries with a banana and a ton of orange or apple juice. Now knowing what I know, adding all that juice to the smoothie just took it from healthy, to sugar and calorie packed. So I added in nutrition and took out extra sugar and viola, a grown up version of my old standby favorite. Try it yourself, it’s so easy and yummy, even kids love it! This Chocolate Banana Smoothie recipe is full of protein, and is one your kids will especially love. Cut the banana into bite size chunks and freeze for 4-24 hours. Blend the frozen banana, almond milk, greek yogurt and cocoa powder along with any mix ins you like until smooth. 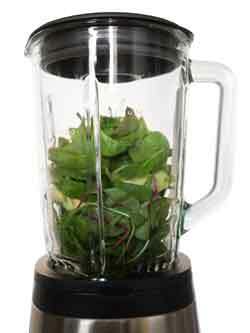 I love adding spinach to smoothies, it has virtually no taste and is packed full of calcium, potassium and best of all it naturally boosts metabolism! The flavor of the spinach is completely masked by the berries, and the color is masked as well, no one will ever know this is a “green” smoothie! 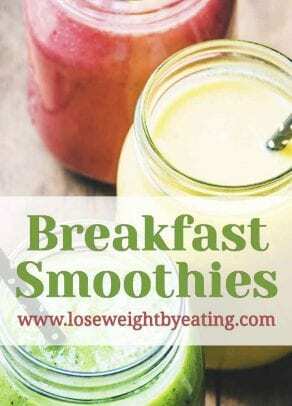 Breakfast smoothies are the perfect weight loss breakfast. They’re packed full of nutrition, can add fresh produce to your diet and the diet of your loved ones without sacrificing flavor. You’ll love how fast you can whip one up and how easy it is to clean up! Be sure to wash your blender right away, it will help keep the smoothie from sticking and take seconds to clean if done right away… if you let it sit it will take much more effort to clean.